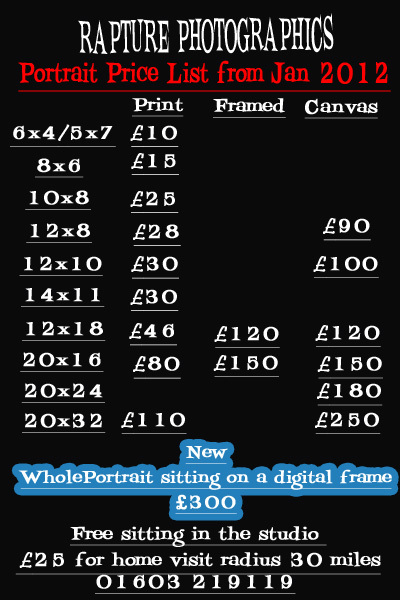 After each sitting we print a proof set for you to select from in the shop or you can purchase the set to keep for £20, which allows you to select at home. These are proofs and do not give copyright so please do not scan them. Please allow 2-3 weeks for your images to be ready for collection after ordering. Hello to all our Hanson Home Portrait customers. We now have a premises in Norwich with a full photo lab so have changed our name to Rapture Photographics. We are always delighted to hear from previous customers and will be happy to continue capturing your children as they grow. For home visits package price will be a minimum of £150 and please add £25. If you don't see the package for you just give us a call and we can taylor one. Family Portrait- Shoot Your Family for Free. To view the gallery page use the following link.